The U23 pool of available players although vast in numbers is also the age group that is most difficult to get released, they are either in phase 1 training, long phase 2 trade courses or in the process of deploying on Ops, on Ops or 7 players this year in Canada on the Winter repair programme, and as such not available for selection. However, whilst the above are justified reasons for unavailability, we as an organisation have still not addressed the issue of talent identification, players are still go through phase 1 and 2 training and not being identified, despite informing their COC, an example this year is Pte Clark RLC who we found in Leaconfield on Monday 11 March who not only played for us but has been selected for CS U23s and the Senior Squad for the County Champs. He is one of a number of players who should have been identified at his Trg establishment and his details forwarded, I have similar examples in from other establishments. Can I please request that Corps identify potential players and let myself or any of my coaching staff decide if they have potential. The way forward, I plan to build on the positives from this season, the Tour being one of these, plus further develop my outdoor fixture programme, moving from weekend fixtures to Wednesday matches, although what I would like to propose is that similar to other Army representative sports we meet the day before and then have the opportunity to develop the squad of players with a morning training session and an afternoon fixture. This would be on a monthly basis, starting with the U23 Trail on Sunday 23rd Sept at Aldershot. The hiring of a high quality coach to develop both the players and to mentor coaches, Mr Phil Goodrum, a Level 4 coach has agreed to assist in this area on Sunday 21st Oct 12 with my Indoor team. I would like to replicate this with a further coach just before the Inter Services next year. More controversially, I have a major issue with the pitch at HMS Temeraire, I am not convinced it is up to an acceptable quality, I can’t replicate it anywhere in the country; the nearest place I could find was the 4G football trg pitch in Aldershot. 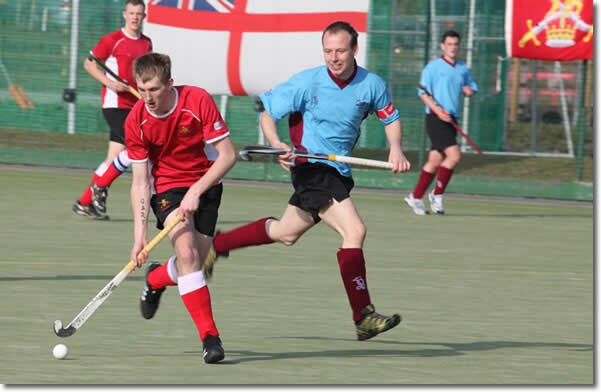 It is not suitable for a competitive hockey match, the option I would like to suggest is that 2 x U23 hockey fixtures are played on the Tuesday of the Inter Services with the other fixture played in the morning of the second day, with all fixtures played on the water based pitch. There is scope with the enforced 1 hour plus CS AGM when the pitch is not in use and in the evening, the pitch has flood lights, why not use them, and with only 5 fixtures on the second day, we could take the early fixture, currently taken by the vets swapping then to the sand pitch. If you wish me to develop potential and to create future senior players, I need to be playing on quality surfaces, not sandpits or spring loaded bundles of plastic grass, both of which are difficult to replicate any where else in the country and therefore to practice on. On the positive side, the Army U23 squad has age on it side, currently we have 41 known players eligible for next season of varying quality and abilities, my management team will be looking for players over this year’s Inter Corps Tournament as well as some of the Inter Unit tournaments and if we can resolve the player identification issues, the squad size and quality will only grow. Our performance in the IS Indoor’s was ok; we beat the Navy convincingly but forgot to turn up for our match versus the RAF losing 4-3 with the final shot of the game, disappointing especially after our performances on the Tour. Our outdoor season started well beating a strong RMAS team 4 -1 but this turned out to be our last competitive fixture before the IS Outdoor’s, not good and despite the hard work done by the coaching team in the final training sessions we were still getting players turn up on the day for the matches. A strong performance against the RAF with a 7 – 2 drumming gave us false hope that we would be able to replicate this against the RN, again we failed to turn up for the first half which found us 3 – 0 down, however, a much stronger performance in the second half saw us score 2 unanswered goals but again fell just short. On the positive side, 10 of our players have been selected for the CS squad, Sig T Smith (Captain) Spr C Tyrell, Pte Bush. LCpl Hughes, LCpl Cornish, LCpl Vincent, Spr Moore, Pte Clark, Pte Rodgers, Cfm Goodridge. All bar LCpl Vincent are eligible for next season, 3 of those selected are only aged 18 or younger. I would like to thank the following individuals that have support me this season, Major Brian Mower for continuing to identify players for me, Cpl Jim Fowler for re-joining the coaching team and Sig Tom Smith, my Captain, all the Commanding Officers who gave up players to me for the Tour and for both Inter Service Tournaments, Charlotte for putting up with the constant changes to my squad and to Alan Flavell for being on the end of the phone to offer guidance when needed. To assist Corps, I have listed all known players and who are age qualified for next season, and ask Corps reps please fwd any additional names of potential players that they are aware of to the undersigned.